The environment is the hot topic on everyone’s lips at the moment, and rightly so. For far too long big businesses have put profits ahead of the planet and we are all becoming increasingly aware of how unsustainable a lot of the products that we consume are. We’ve seen this hit the headlines with shoppers turning their back on big brands with unsustainable packaging including Walkers and Pringles. Big businesses need to defend their position. They can do this by improving their offering, or by trying to silence those who challenge them. The latest effort to silence a brand comes from the MPMA (Metal Packaging Manufacturer’s Association), who are threatening the independent, ethical dog food brand, Pooch & Mutt. Pooch & Mutt’s advert urges people to “Ditch the Can. 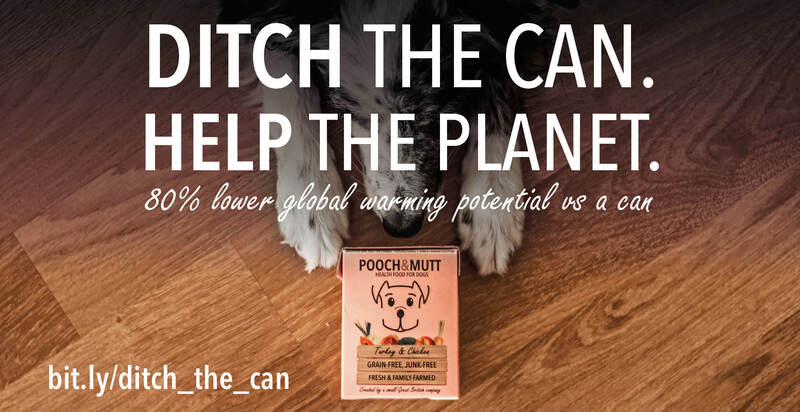 Help the Planet”, as the TetraPak cartons that they use for their dog food have been proven in independent studies, such as the study by the Institute for Energy and Environmental Research (IFEU) to have 80% less global warming potential than cans. The benefits are so great that the number of cartons sold in the first 6 months of launch, had the equivalent benefit to the environment of planting 200 trees! And this is from a company, who is a minnow in the pet world compared to the whales of Mars (Pedigree, Royal Canin, James Wellbeloved) and Nestle (Purina, Winalot, Tails.com). 4. Space when full: Cartons offer a 40% space saving Vs cans. This press release was distributed by ResponseSource Press Release Wire on behalf of Pooch & Mutt in the following categories: Environment & Nature, Business & Finance, Media & Marketing, for more information visit https://pressreleasewire.responsesource.com/about. On a mission to help dogs lead Happy Healthy Lives by making the best Grain-Free foods, treats and supplements a dog can get. Ditch The Can. Help The Planet.